The McKenzie Bib Short from ProCorsa features the finest Italian cycling fabrics and chamois for a premium piece of kit that goes all day. Designed in Portland, Oregon, the McKenzie Bib short is named after one of the state's most iconic mountain passes, so it features a 14 panel, flat-lock stitched construction to ensure comfort mile after mile, and one elevation marker after another. The high-end PERFect chamois features a seamless design with ultra high density padding that breathes and holds up as the rides keep piling on, and wide mesh bib straps up top comfortably keep everything in place. At the cuffs, generously sized compression bands provide even pressure distribution for a gentle and luxurious fit, and they're cut a slight angle for a little extra style on the road. The understated look of the short is exemplified by one small ProCorsa logo on the left thigh that lets the quality and craftsmanship of this garment speak for itself. I admit I'm biased because I was very involved with the design process of these bibs. No bibshort is perfect for everyone, so I'll focus this review on the decisions we made and why we made them. One of the key elements of any cycling short is the chamois. We chose the Road Performance chamois from Cytech. Cytech is a pioneer in cycling chamois design and manufacturing, and was the first company to develop stretch chamois which they call elastic-interface. This allows the chamois to stretch along with the short fabric which means that it is less likely to chafe as you move around on the saddle. The Performance Road chamois is one of their highest-end products, but it is a little thinner (although denser) and narrower than than the chamois you'll find on many lower-priced shorts. If you are looking for a wide, thick pad, this isn't the short for you. The fabrics used in the short come from MITI, an Italian technical fabric manufacturer well regarded for their quality. We decided to go with a rolled cuff instead of a gripper to provide better compression and improved comfort. I personally like shorts that end a little above my knee, so the leg length is a little shorter than some shorts, but this places the double thickness cuffs at the ideal position to provide maximum compression benefit. The MITI Shield Endurance fabric is a bit thicker than you'll find in many cycling bottoms, particularly at the lower price points. Some people may find this results in a slightly warmer riding short, but our goal was to provide a maximum-performance product at a bargain price so we decided to go with a fabric that delivered higher lycra content that delivered excellent compression. The McKenzie does not skimp on production complexity to save cost. 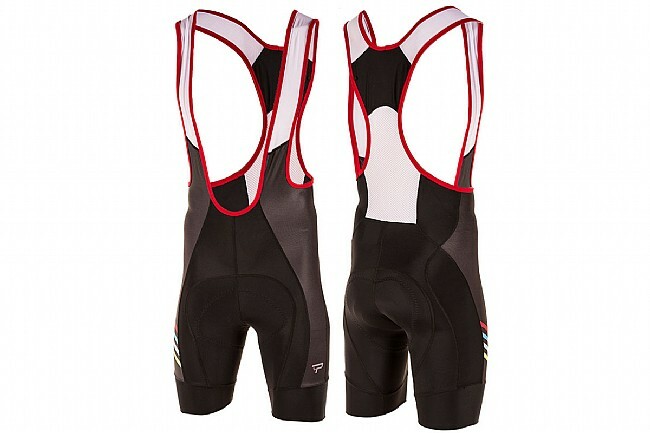 Bibshorts in this price range typically limit panel count to 6 or 8 panels to save cost. We wanted to deliver a premium product with excellent fit, which dictated a 14 panel lower construction. This product isn't for everyone. If you're looking for a typical lightweight bibshort that you barely feel with a wide, thick pad, this isn't the short for you. If you are looking for a high-performance product that will keep your muscles feeling fresher on a hard ride, and don't like to feel like you are wearing a diaper, this is an absolute steal. Here we have an affordable offering thrown into the infinite mix of plastic cycling-centric britches. The appearance and construction of the bibshorts are quality and understated, with considered paneling and good attention to detail. 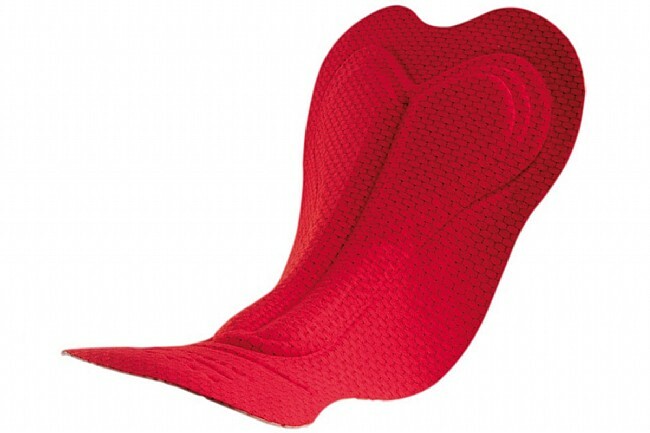 The chamois is also top notch, which provides a firmer and more supportive feel than those of some competitors. The fit is a bit interesting, in that the bib straps are positioned closer in than usual, so they go somewhat inside of the pectoral area instead of over it, and the leg bands lack grippers for some reason which makes riding up an issue. Overall however, a solid choice for longer rides and for consistent use as the fabric and chamois are top quality. I did my second century in this bibs last weekend and I continue to be impressed. After about 20 wash cycles, they are holding up well. The only sign of wear is a very slight curling of the logo on the thigh, but this is other shorts I own. These bibs are nice looking and fit great. The bib straps are nice and wide and are very well vented so they don't feel hot, even in the 90 degree weather I had last weekend. The chamois is firm and not too thick, just the way I like it. After over a hundred miles, they still felt fine. If I compare these side-by-side with my high-end bids (some of which I'm embarrassed to say I paid more than $300 for), these have a construction quality that is comparable in every way. The fabrics have a great feel and a lot of stretch. 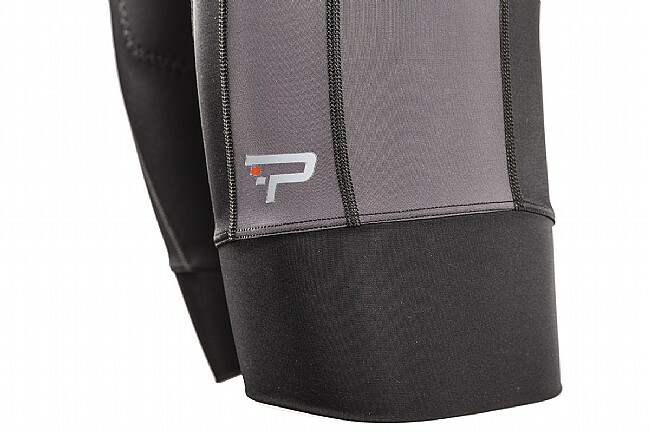 I love the wide compression band on the legs - much better than the silicon grippers many of my shorts use. I'll definitely be buying more of these. I have to say I'm very impressed with the quality of these bibs. I've seen this brand on BTD for a few years but never gave them a try, but the photos looked quite nice. The shorts fit great and are very well made. I haven't seen bibshorts of this quality for less than $200, even on sale. The material has a really nice feel and has great compression. I bought the black/grey version and they have a very elegant look. The mesh in the front of the straps felt slightly scratchy at first, but I didn't notice them while riding, and after a couple washes they feel pretty soft. The front comes up slightly higher than I like, but the fabric is so stretchy that it's not hard to pull them down enough to take a leak. The chamois is top quality. Not too thick, but with firm foam that feels quite nice after a long ride. I haven't had them long, but the chamois feels like it will hold up well with miles. Overall, these are some of the most comfortable shorts I've ridden and they look and feel like they'll hold up well with lots of miles and lots of washes. I'll definitely be buying more of these. Ive been using a top Italian brand for many years. 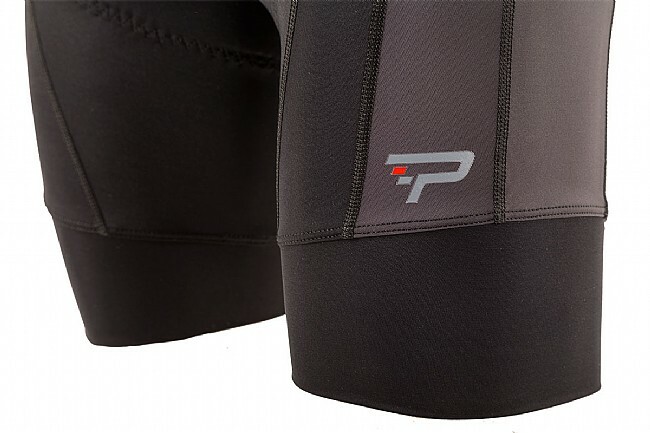 The ProCorsa have surpassed the fit and comfort level. The chamois is extremely comfortable on 3 hour rides. Bibs fit great and are great value. I first read all the reviews, which were mixed. Some good, some not so good. Based on the price, I decided to buy them. After wearing them for over a month, I agree with all the previous comments. Straps are different, chamois area is smaller than usual. But, I really like these bibs despite any design issues. Great value ( deal of the day) and great product. Really nice, well made, and comfortable. M fits well at 5'9160. Also - like all of the ProCorsa gear - the logos are very subtle, which is important to me as well. Nicer than most bibs in this price range. Excellent quality fabric with good stretch and compression. The chamois is high quality but a bit more minimalist than some. This appears to be the Cytech Road Performance Chamois, which is a high-end chamois but is more oriented to riders that don't want a lot of bulk. The biggest downside is that it isn't really wide, so if you ride a wider saddle, this might be an issue. Cytech provides chamois' to most of the top-end brands such as Assos and Raffa, so ProCorsa doesn't seem to be trying to save money here. The bib straps are good quality but not as soft as some of the more expensive products. I usually wear a mesh base layer, so this doesn't bother me, but if you wear the bibs against your skin, you may find the straps a bit rough feeling. All in all though, this is a very well made bibshort, and if you can get it on sale in the $120 range, it's a steal. I have used several different brands and I think the longevity and value is awesome. Very nice shorts except for this tiny seam where the ends of the red tape edging around the shoulder straps overlaps makes an itchy spot right between my shoulder blades. It bothers me enough to not use them. Too bad because otherwise I like them. I really wanted to like these, but the chamois is just too narrow for me which makes them uncomfortable on long rides. A year-plus ago, I bought these for a song on a deal through my Portland-area cycling club. I figured if nothing else, they'd be a fine extra set of bibs. Recently I've found myself gravitating to these due to their quality of construction and comfort. They've held up well, where a set of much more expensive Capo's purchased around the same time, have not. Fit is European I'm 5'11, 170lbs and the Large fits me okay - but I'd say I'm on the cusp. Any larger than me, and XL or larger is the way to go. Initially, compression is pretty tight on big legs, but they do break in some. Upgrade the chamois and you will have a winner! It is correct to say every body is different and bib-shorts are very personal item to purchase. These shorts are very good but I think for the greatest number of riders the legs are too shorts, the chamois is too small and uncomfortable. For riders who prefer race chamois go for it. At 5'9 170 lbs., large fits good. I ride approximately 500 miles a month. I'm disappointed. I thought I would really enjoy these bibs based on most of the reviews. Yes, they are constructed really well from pretty good materials. The shortcomings are that the legs are too short (compared to my other bibs) and the chamois is too thin to eliminate the obvious moose knuckle. I'll probably end up putting these on an auction site and list them as a roomier size small. Freddie's follow up to my 342016 review, standing by it. I am still wearing the same Bib that I reviewed, must say I am happy I stayed with them. I think they are the Rogue's because my Chamois looks a little different from that pictured on the McKenzie's. I roll on the Selle SMP saddle and have noticed added comfort with the ProCorsa Chamois. I will purchase again, they are holding up better than some of my higher dollar ones. I'll be sure to buy McKenzie's. The pad is great (at least for me). The compression is good (may even a bit too much), but the material at 90 degree weather does not breathe well at all. And the chest straps are way too wide and come up too high. Combine that with the non-breathing material, I am not sure if I will keep these. I would not mind paying a bit more for the same cut but with a better material. It may be good for riding in cooler weather.